“Prayer is talking to God.” You’ve heard that before. But let’s not confuse it with what you see in the movies and on TV. Prayer is NOT a ritual, neither is it an exercise. It is the sharing of your ideas and feelings with your spiritual Father. There’s something supernatural about it. You’ll see why as I explain the mechanics of prayer. When you were saved, you opened your heart to Jesus. He came in. If someone were to ask you where Jesus is right now, you’d say, “He’s in my heart!” But look what that means! There are two people living inside your body, you and the Lord. The Bible describes your body as the “temple of the Holy Spirit” (1 Cor. 6:19). Via the Holy Spirit, Jesus now lives in your body as surely as you do. The Scriptures are specific about this. “That Christ may dwell in your hearts by faith,” is what they say in one place (Eph. 3:17). And again, “Christ in you, the hope of glory” (Col. 1:27). You are wondering how that’s possible. The answer is simple. The Lord does not have a body. There is nothing physical about His presence in you. He is spirit. The Bible is definite about that too (1 Cor. 15:45). It plainly says, “Now the Lord is that Spirit” (1 Cor. 3:17). This means you can’t see Him or feel Him. His presence is totally beyond your five senses. But this doesn’t mean you can’t enjoy Him. You can, but you have to do it by faith. When you asked Jesus to come into your heart, did you feel anything? I mean did you feel something physical enter your being? No. You may have experienced emotion. After all, peace with God is no small thing. And to have all your sins forgiven lifts a great burden from your spirit. You’re bound to feel that. But to touch or hear the Lord is impossible. He is spirit. And ALL spirit-beings, the Lord included, are beyond our awareness. So then we live in the conscious and the Lord Jesus lives in our unconscious. Picture you as living in the area of the brain and the Lord as dwelling in your heart. These are merely symbolical ways to picture a spiritual truth. Because when I say heart, I certainly don’t mean that muscle which pumps blood through your body. By heart, I mean what you mean when you say you love someone with “all your heart.” It’s that part of your being where you SENSE things rather than have any CONSCIOUS AWARENESS of them. Inasmuch as the Lord dwells in that part of your being where you cannot contact Him with any of the five senses, there is no way for you to make direct contact with Him. Even though you are not able to be aware of Jesus, He is perfectly aware of you and all that goes on in your mind. He sees every thought in your head. Why? Thoughts are spirit. And since He is spirit, everything that takes place in your thought-life is open to Him. In fact, the Bible says, “He is a discerner of the thoughts and intentions of the heart” (Heb. 4:12b). While you are not able to peer into your heart to see the Lord, He is able to view your mind and see all that takes place. If that sounds a bit threatening right now, it won’t when you find out the He loves you without limit—even though He sees you AT YOUR WORST. HOW DO I KNOW THE LORD? Isn’t it fascinating to think that Jesus is closer to us than our hands or feet, yet we can’t speak to Him directly? He is nearer than our own breath, yet we do not experience Him as we do others. How then do we respond to His presence? That is, how do we enjoy Him? We do it with our imaginations. Does that sound strange? It shouldn’t. Imagination is a fabulous tool. No animal has the ability to imagine, only man. Because of this amazing faculty, man can visualize things that do not exist in the physical world. That is, he can see things in his imagination before they come into being. It is imagination that makes it possible for us to dam rivers, build great bridges, and explore outer space. We must be able to SEE these things before we can do them. Creative use of the imagination is NOT it’s highest purpose. It’s most noble function is to give reality to our unseen Lord. It is God’s intention that we should visualize Him. That is, we are to PICTURE the Lord in our minds and then enjoy Him—by faith. There is nothing fictitious about it. After all, He DOES live within us. The Spirit of God settles that truth with His witness to our spirit (1 John 3:24b). If we can visualize a relative who lives across the country, we certainly ought to be able to visualize the One Who lives in our hearts. Is it Scriptural to do this? Yes, the Bible says that Moses was able to leave Egypt in the face of Pharaoh’s wrath because his strength came from “seeing Him Who is invisible” (Heb. 11:27). Moses SAW the Lord in his imagination. Then there’s King David. He did the same thing. “I foresaw the Lord always,” he said (Acts 2:25). The fact is, the divinely ordered way for us to know the Lord is for us to visualize Him in our imaginations and then enjoy Him. You might be tempted to think that prayer is easy and natural. All you have to do is picture the Lord in some way on the screen of your imagination and talk to Him. It’s not as simple as it sounds. It’s getting yourself to do it that is hard. We live in physical bodies. Our way of life is geared to what we can see, touch, taste, hear, and smell. But prayer is NOT physical. It has nothing to do with the way we live. To STOP and talk to a Person we can’t see or hear is not natural at all—it’s unnatural. Since the Lord cannot be contacted by any of the five senses, what is there about our relationship with Him that would remind us to talk to Him? Nothing. You know the saying, “Out of sight, out of mind?” Well, that’s the problem with prayer. We have to discipline ourselves to talk to the Lord. He doesn’t jab us. There are no bells that ring, no sensations that surge through our bodies. There is nothing. The whole thing is up to us. The Lord has done His part in making the fellowship possible. He even lives within us, but we are the ones who have to take it from there and develop the fellowship—by faith. We must put Jesus in the normal routine of our lives. We go through the monotonous cycle of three meals a day, on the job, and back to bed, but the Lord has no part in all that unless we PUT Him there. A person has to stop what he is doing if he wants to pray and that is an interruption. When a man has to force a break in his routine, it is always an interruption. The very law of motion tends to forbid prayer. Once we get our day started, we hate to stop for anything. We resent interruptions. Therefore, prayer is the GREAT INTRUDER in our lives. It interrupts our pleasures, our plans, our laziness, our TV, and our jobs. How do we overcome this intrusive element of prayer? When it hits us that the One Who made us not only shares our bodies but also our DAILY ROUTINE, that does something to us. We’re never quite the same after that. It can be a shock to find that the Lord is not merely a SPECTATOR but actually PARTICIPATES in everything we do. Whether we’re aware of it or not, He is involved in everything that happens in our lives. It can be a little frightening to realize the eternal God is that close to us, but we don’t mind at all, once we discover what a really great PERSON He is. The Lord is gentle, forgiving, and kind. He desires the BEST for us, no matter how badly we behave at times. How can we fear Someone who can’t wait to forgive us? And here’s another terrific thing about our Lord—He never changes. Once He falls in love with us, His passion for us never varies. It doesn’t make any difference what we do, His love is steadfast. Never once does He lose His temper, for He feels nothing but total sympathy for our weaknesses. This world has never seen anyone so gracious, so patient, and long-suffering. He is the most NON-THREATENING Person anyone can hope to know. There is such a place. It was known to David, the Psalmist of Israel. He put it like this: “He that dwelleth in the SECRET PLACE of the Most High shall abide under the shadow of the Almighty” (Psa. 91:1). You should start thinking about this room in your mind. It’s the most important room in your life. No one ever goes into it but you and Jesus. It’s here that you worship the Lord. The idea of being face to face with the One Who made you might sound a little frightening. But there’s nothing to fear. He is aching to have you fellowship with Him. So relax. You’re in the presence of your BEST Friend. There’s no one who cares for you as He does. And don’t worry about His viewing all that takes place in your mind. He sees those thoughts and loves you desperately anyway. Now then doesn’t that make you eager to start enjoying Him in the “secret place?” When you consider the fantastic friendship that is just waiting for you, shouldn’t prayer have some priority in your life? 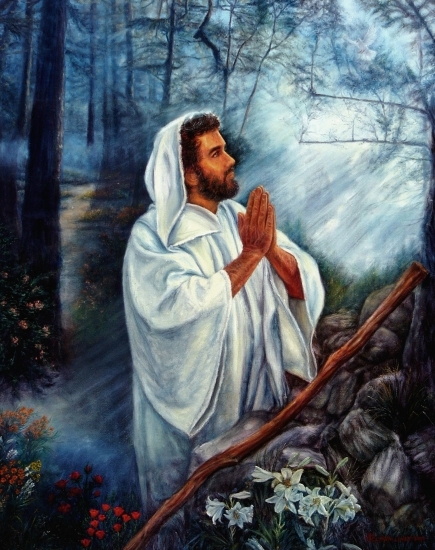 Whenever things got too hectic for Jesus, He would take time out to get alone with His Father. Like us, He needed the refreshment of being with the One Who knew Him and understood everything He felt. Even though He walked in His Father’s will and His days were filled with wonderful works, it wasn’t enough. He hungered for something more—intimacy with His Father. The same is true of us. A Christian can be busy preaching and witnessing, studying and attending meetings, and his soul still could be unsatisfied. The one thing he needs most is missing—intimacy with Christ. Some don’t recognize this need. But if neglected, it will rob a Christian of his joy and affect everything he tries to do. © 2018 Personal Christianity. All rights reserved. Answer: As for the soul, that is what Genesis calls the “image of God.” God made man in His image (Gen. 1:27). However, since God is spirit, His image must be spirit also (John 4:24). If we accept that, then the body is merely a vehicle that allows him to get about on this planet. It seems clear the soul is eternal, whereas the body is a temporary “earth-suit” he lives in, so he can be tested to see what he will do with his free will. Also, he lives in space and time which are also created. During his sojourn on earth, man hears about the Lord in various ways as the Lord reveals Himself to men. A man makes a freewill choice to love God and trust Him or shrug off whatever revelation he has received. If he elects to trust God, he is qualified to spend eternity with Him in Heaven. If he rejects the revelation he received, he is forever separated from God in Hell. THE NEW DEALING WITH THE DEVIL BOOK AVAILABLE NOW! 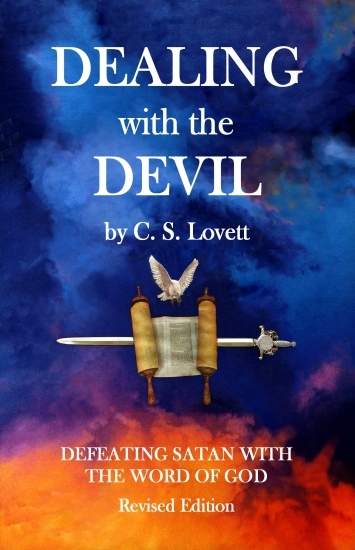 Dr. Lovett’s best-selling book DEALING WITH THE DEVIL has been updated and revised and is now available on Amazon.com. It is a paperback book, 241 pages, and sells for $14.99. For more information and purchasing details, click HERE. THE PREPARED LIFE book is available on this link, click HERE. These books may also be available by ordering through your Christian bookstore.